Some months ago, I was in Belfast on a Friday evening, wandering, killing the time for a few hours. I was passing a secondhand record store and noticed that its door was open. So I went up the stairs, and in. There were no customers flicking through the records, just a man and a woman, both in their early 40s, I thought, sitting on a step, surrounded by empty beer bottles. The man had a joint in his mouth. They stared up at me. I mention this episode, because it is impossible to imagine it occurring — the wandering, the door left open — in the Belfast I first visited in 1978 when I was 20, or the Belfast described in Patrick Radden Keefe’s Say Nothing, which starts with the abduction of a woman called Jean McConville, a young widow and mother of 10 children, in 1972. Keefe homes in on McConville and other individuals and, while doing that, tells a good-sized chunk of the history of Northern Ireland, a place George Bernard Shaw called “an autonomous political lunatic asylum.” In particular, he writes about what became known as the Troubles, and the people who caused or were caught in the Troubles. The Belfast of Say Nothing is a city of religious divisions, security checks, shootings, no-go areas. The city is small; it’s “Blue Velvet,” with none of the velvet. Jean McConville’s children know some of the people who are taking away their mother; they are their neighboUrs. The last thing she says to the eldest son at home at the time is, “Watch the children until I come back.” But she never does come back. She disappears — she is disappeared. If it seems as if I’m reviewing a novel, it is because Say Nothing has lots of the qualities of good fiction, to the extent that I’m worried I’ll give too much away, and I’ll also forget that Jean McConville was a real person, as were — are — her children. And her abductors and killers. Keefe is a terrific storyteller. It might seem odd, even offensive, to state it, but he brings his characters to real life. The book is cleverly structured. We follow people — victim, perpetrator, back to victim — leave them, forget about them, rejoin them decades later. It can be read as a detective story. There’s a nappy pin (a nappy is a diaper) at the start of the story, and at its end. When the pin reappeared, the novelist in me wanted to whoop but the reader wanted to weep. Because Say Nothing isn’t a novel, and that comfort — it’s only fiction — isn’t there. The nappy pin isn’t a novelist’s device; it was a real nappy pin, a small tool carried everywhere by Jean McConville, a mother. Its closeness to the novel is a strength of Say Nothing and — I’m tempted to write — “also a weakness.” But actually, it’s not a weakness, and only rarely a distraction. Occasionally, Keefe lets rip with the similes. “Petrol bombs,” he writes, “broke open on their steel bonnets, blue flame spilling out like the contents of a cracked egg.” That’s asking too much of an egg. On the other hand, his description of Dolours Price, a member of the IRA, in jail, on a hunger strike, being force-fed through a thin length of rubber hose, is vivid and quite rightly shocking. The book is full of the language of my youth, phrases I heard every day — “political status,” “shoot-to-kill policy,” “dirty protest,” “legitimate target.” And it is full of names, names that are more than names — Gerry Adams, Bobby Sands, the Price sisters, Burntollet Bridge, Bloody Sunday, Enniskillen, Margaret Thatcher, Ian Paisley — the names of people and places, events, that carry huge emotional clout, that can still silence a room or start a fight. It is about who owned the language, or got the most out of it. Yes, the times were known as the Troubles. But as the Belfast writer Jan Carson puts it in her upcoming novel, The Fire Starters: “Troubles is too less a word for all of this. It is a word for minor inconveniences, such as overdrawn bank accounts, slow punctures, a woman’s time of the month. It is not a violent word.” So the IRA invented the “armed struggle.” Violence joins injustice — it was the work of a marketing genius and the solid conviction of hundreds, thousands, of men and women: It was their war, their struggle. What Keefe captures best, though, is the tragedy, the damage and waste, and the idea of moral injury. Dolours Price and many like her believed that, after the signing of the Good Friday Agreement in 1998, she had been robbed of any moral justification for the bombings and abductions. The last section of the book, the tricky part of the story, life after violence, after the end, the unfinished business, the disappeared and the refusal of Jean McConville’s children to forget about her —I wondered as I read if Keefe was going to carry it off. He does. He deals very well with the war’s strange ending, the victory that wasn’t. A more likely outcome, I fear, is a fresh border dividing Ireland, right on top of the old one. When the Republic of Ireland and Britain joined what became the European Union on the same day, in 1973, the border immediately started to become less relevant. The EU is a big part — the boring part — of the story. The border is there but hard to discern; “Spot the Border” is a popular game with people driving across it. Driving north, the km become miles and the road signs are in English instead of both English and Gaelic. But there’s no evidence of the checkpoints or observation towers that were there before the Good Friday Agreement. Since the Brexit referendum, much has been said, and promised, about “soft” borders and “hard” borders. But as someone observed — I can’t remember who — all borders are hard, and the line across Ireland will be the only land border dividing Britain from the EU. There will be checkpoints; there might also be observation towers. There will be men and women in uniform; there might also be armed soldiers with English and Scottish accents. There will be trouble, and there might also be Troubles. 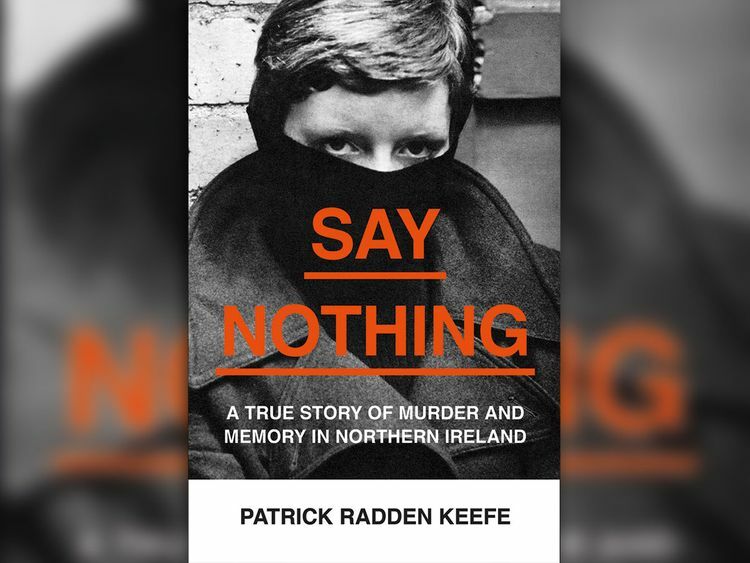 Say Nothing is an excellent account of the Troubles; it might also be a warning.